What is a Reward and Recognition Program? ‘Reward and recognition’ is the activity employers engage in to acknowledge exceptional performance and encourage specific values or behaviours within their organisation. By formalising this activity into reward and recognition programs, employers can make it easier for HR teams, managers and colleagues to recognise the work of their colleagues, fostering better engagement and implementing positive change in the process. 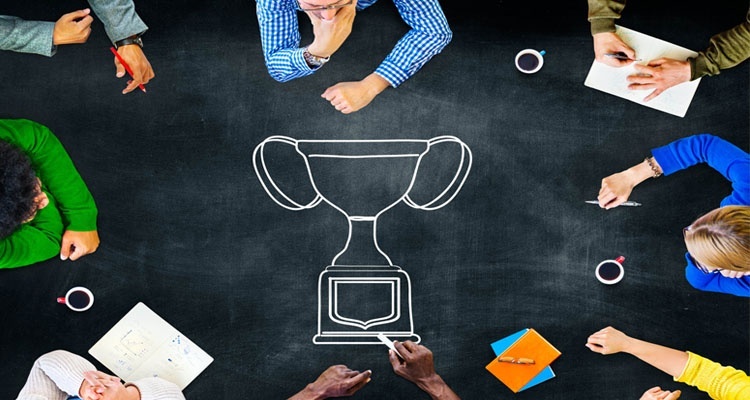 Why should employers acknowledge exceptional performance? Distinct from salary and benefits, employee recognition has an important role to play in motivating and engaging staff. Recognition can be monetary, non-financial or simply a public acknowledgement of someone’s efforts and often it’s simply the act of saying thank you that has the most impact. One well known study by Glassdoor found that 80% of employees would be willing to work harder for an appreciative boss and 70% said they’d feel better about themselves and their efforts if their boss thanked them more regularly. How can this encourage specific values or behaviours? Reward and recognition programs can send a clear message about the values and behaviours that are important to an organisation. Employee recognition awards can be directly linked to a range of different attributes, from straightforward performance to softer, value-based behaviours such as ‘creative thinking’, ‘showing integrity’ or ‘self-improvement’. Staff can then nominate their colleagues for exhibiting these behaviours and, by aligning them directly with recognition awards, employers can make a clear link between how employees act and how they are rewarded. With this in mind it’s important to avoid making employee recognition solely about performance and to strike the right balance between financial and non-financial awards. Unlike other aspects of the reward package such as salary, benefits or performance-related bonuses, employee recognition gives employers the opportunity to send a clear message to employees about its workplaces culture. So how does a reward and recognition program work? Essentially it’s a mechanism that gives team members the opportunity to nominate their colleagues for recognition awards. So, if a manager feels one of their team deserves to be recognised for their ‘impressive attitude towards learning and development’ they can suggest to the powers that be that their team member deserves to be given an award (either monetary or non-monetary). This would be approved by management based a set of pre-agreed criteria. It can be approached in a couple of different ways, either in a non-formal, ad hoc way (picking up the phone or sending an email) or via a formal scheme. In our experience the best reward and recognition programs are formal, fully automated, online portals that can be accessed remotely. These make it quick and easy to nominate colleagues, publicly celebrate staff achievements and redeem rewards. Particularly for large organisations that may have remote workers or employees based across lots of different locations, this is the best way of encouraging staff to use a scheme. Moreover, the technical functionality of portal-based programs allows for greater social recognition, via tools such as winners walls, message panels, likes and colleague notifications. In addition to automating the approval process for granting recognition awards, portals avoid the need for any paper filing, thus introducing operational efficiencies and allowing employers to capture insightful data about how a scheme is operating. Anything else should I consider? To get the most out of a reward and recognition scheme there are a number of other points that employers should consider. Firstly it’s important to communicate the launch of any scheme to your employees. We would usually recommend developing a detailed communications plan around the launch, incorporating a range of different channels including posters, presentations, emails, internal intranet platforms, social media platforms, SMS messages, staff handbooks and more. It’s particularly important to have managers engaged from the outset as we sometimes hear stories of them getting in the way (some may not be naturally good at recognising the efforts and achievements of their team, whilst others will give the impression that they don’t want to spend budget). As such it’s important to clearly communicate the benefits of recognition to them and involve them in the process. Secondly, don’t just stick to set dates of calendar events: our own research on this topic found that receiving rewards spontaneously and for good work was more likely to make employees feel recognised than receiving them at events such as Christmas or on their birthday. Lastly, it’s important for the scheme to be seen as fair - if rewards are viewed as being unfair it can be a big demotivator for the rest of the team – so have a very clear process in place for nomination and approval. Download our free e-Book on how to build an effective Recognition Strategy to find out more about how a reward and recognition scheme could work for your organisation.